The 33rd Annual Martin Luther King Jr. Skanner breakfast had much to celebrate this year in Portland, Oregon. Hundreds of people throughout the community including Governor Kate Brown, Portland Mayor Ted Wheeler, Senator Ron Wyden, Senator Jeff Merkley, and Congresswoman Suzanne Bonamici, gathered to recognize and remember the life and legacy of the Reverend Dr. Martin Luther King, Jr.
King would be celebrating his 90th birthday and the keynote speaker Larry Gosset, King County councilor, challenged others to think what King would say today if he were alive. 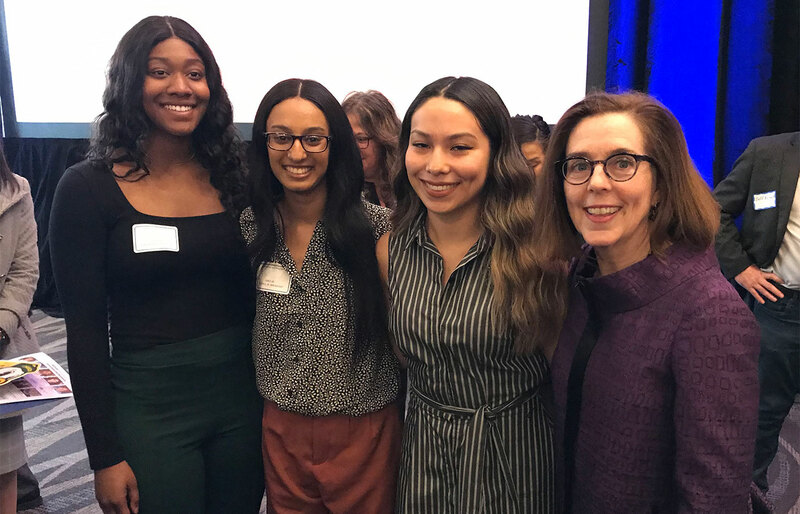 “We have been awarding partners with Skanner for years and this year I am particularly delighted to celebrate scholarship award winners Makayla Agnew, Hiermon Medhanie, and Melissa Torres-Duran. They represent the Skanner mission and the values we hold true at the University of Oregon as well,” said Roger Thompson, vice president for Student Services and Enrollment Management.